Y’all know I love me some Thirty-One! These bags, purses, wallets, totes, home decor and all sorts of great stuff are not only super cute, but also super functional! I LOVE LOVE LOVE these products! I’m not going to lie, they are a bit pricey, but there’s always so many great ways to get deals, by shopping monthly specials and hosting parties. But, my favourite way to save is with their outlet sales! And guess what? 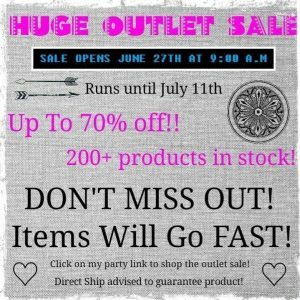 It’s just been announced that Thirty-One Gifts is running an outlet sale starting tomorrow (June 27th) at 9am and running through July 11! This is a great time to shop as there will be over 200 products up to 70% off!!! Not only will you get amazing products at a great price, but your orders will also count towards this month’s customer special, where you can get any item in the crosshatch pattern for half price, with every $40 spent!!! AMAZING! Since it is while quantities last, you’ll want to shop early and be sure to select ‘direct ship’ so your orders are processed immediately. Want to save an extra 25% on top of these amazing outlet deals? Join Thirty-One and earn a paycheck selling these awesome bags! Sounds like a great sale! Will have to check it out today!